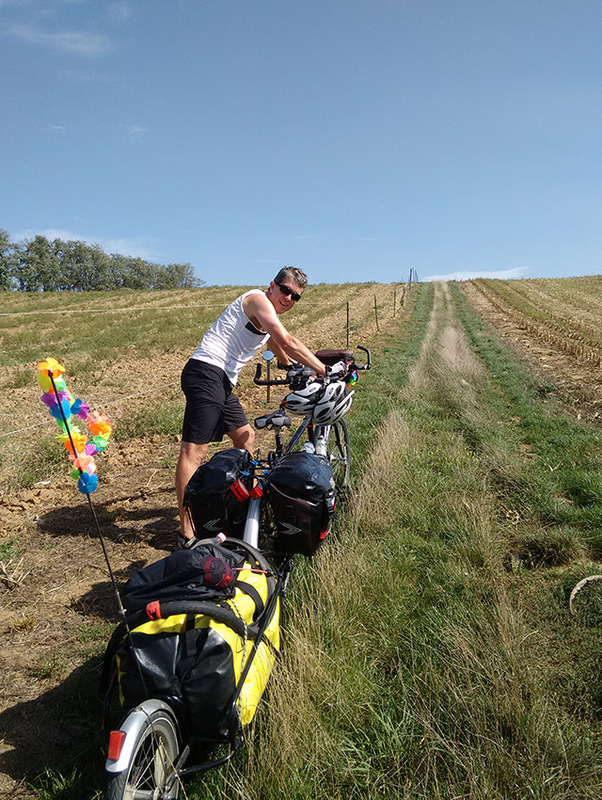 Warning: this post has nothing to do with Portugal but it is about cycle touring (and why I haven’t been posting any updates for the last month) so hopefully still of interest! 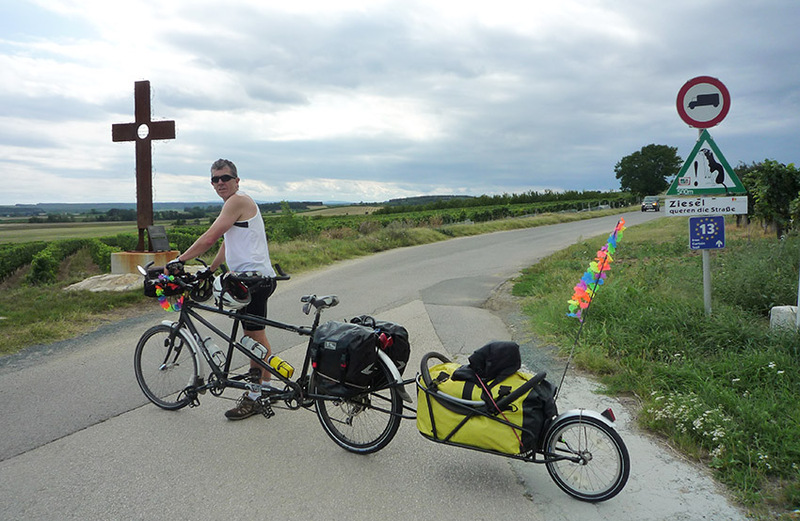 To celebrate my 50th birthday – and in the interests of trying out the roads in a few countries I’ve never visited before – my wife and I flew with our tandem to Zagreb in Croatia at the end of August. Our journey almost ground to a halt before it began. 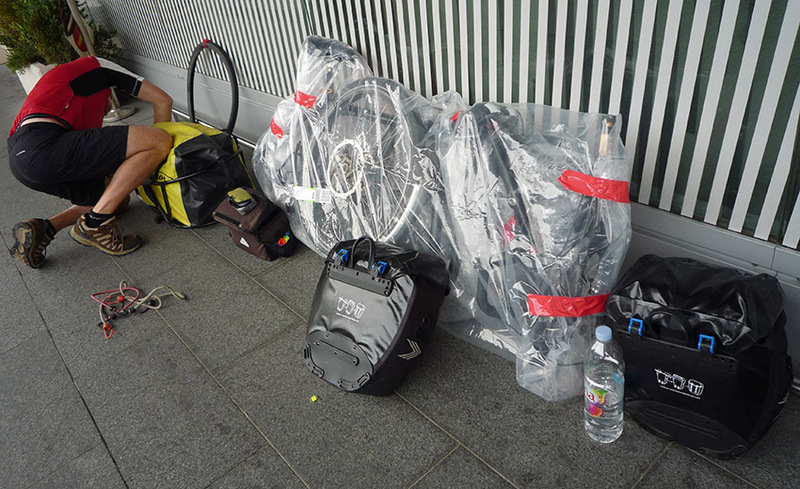 We’d flown with British Airways, which takes bikes at no extra charge as one piece of luggage. 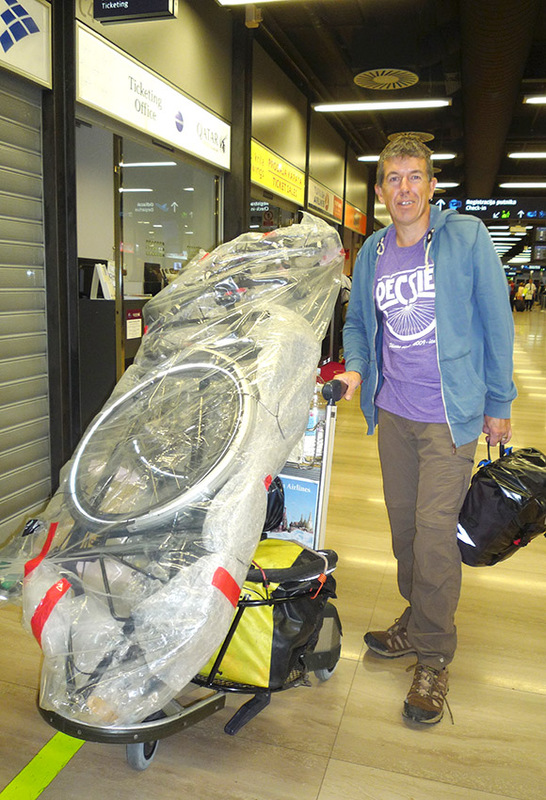 The only issue with a short-haul flight was that the bike had to be no longer than 190cm. Which meant our tandem had to be partially dismantled with both wheels removed. All went well leaving London and we landed in Zagreb on a Saturday afternoon to temperatures of about 32°C. I set to work putting the bike back together in the shade of a tree outside the airport terminal. Everything seemed fine. Until we got on the bike and tried riding it. At which point the chain just kept coming off every time we turned the pedals. I couldn’t work out what was wrong at first but Carolyn, looking down from above, spotted the problem. Somewhere in transit the chainset had been really badly bent and the outer couple of rings were now at about 15 degrees to where they should have been. Extremely frustrating and really irritating as I’d replaced the chain rings about a month previously specially for this trip! To cut a long story short – helped by a man with some heavy duty pliers – we got the bike so it was possible to ride and the following Monday found a bike shop that was able to replace the two damaged rings for about £30. 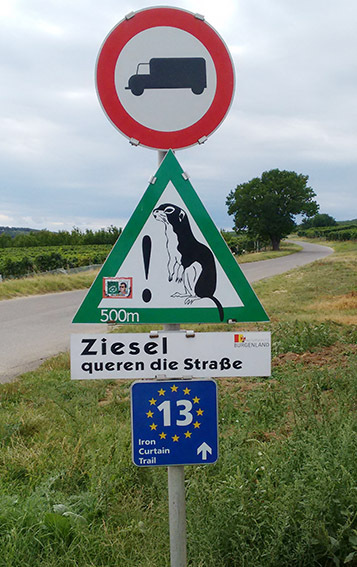 Luckily, that was the only problem we had over the next four weeks – we didn’t even have a single puncture (reaffirming my faith in Schwalbe Marathon Plus Tyres). 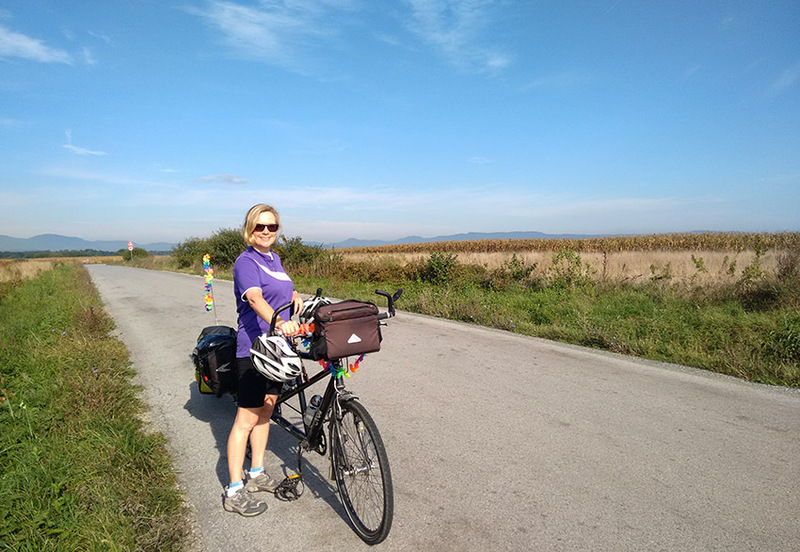 From Zagreb we rode north into Hungary (via a corner of Slovenia) and then zigzagged along the Austro-Hungarian border for several days as we headed towards Vienna. 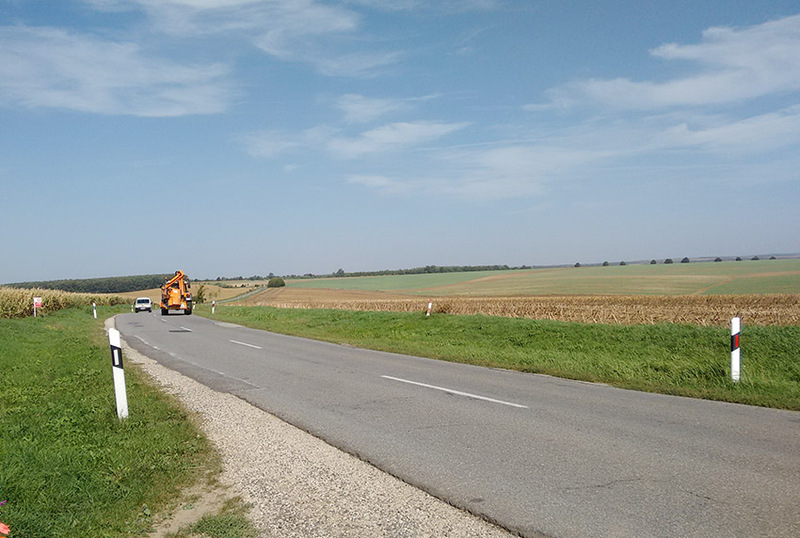 Riding north-east towards Vienna we hit some of the worst head winds I’ve ever had to cycle into on a laden tandem. It wasn’t just the strength of the wind that was the problem it was the gusts. We’d be plodding along, managing about 12mph on the flat, then there’d be a sudden ferocious gust and we’d be doing 6mph. The only positive thing about the wind was that when it hit from the side it was blowing us off the road rather than into the traffic. Vienna was grand. Very grand. Lots of bike paths too so relatively easy to navigate. But after a day or so I was happy to get back out into the countryside and to places built on a more human scale. All those huge palaces were just too much. We had one night in the Czech Republic, in a gorgeous little town called Valtice, which boasts a delightful old square and a lovely (much more modest-sized) chateau built by the Princes of Lichtenstein after they got booted out of their previous pad. 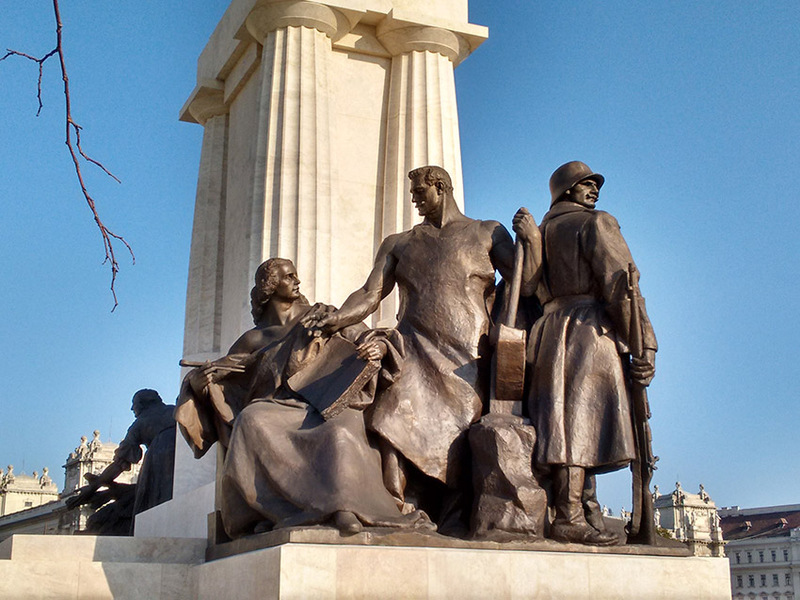 We had two nights in the Slovak Republic but apart from some pleasant hill country in the far west and one attractive old town (Trnava), the country didn’t leave a huge impression. The cakes were good and our third day in the country was spent almost exclusively on off-road cycle paths but the weather was grey, the roads were bumpy, the traffic heavy and the scenery fairly pleasant but not exactly exciting. 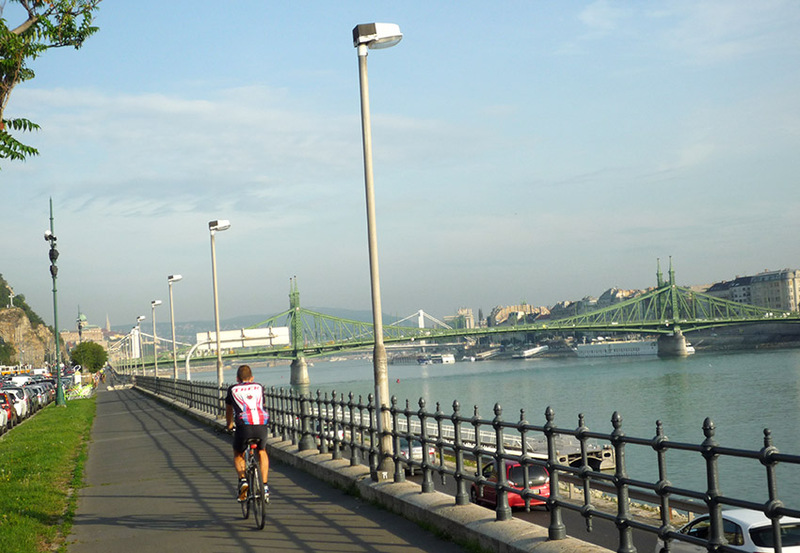 Crossing back over the Danube, we stopped in Esztergom in Hungary (impressive basilica) and then were on one of the main cycle tourist routes in the region – following the Danube Bends south towards Budapest. Budapest was cool. Mix of imposing buildings (but not as OTT as in Vienna), modern sections and the old castle district. We soaked our limbs in the 16th century Kiraly Baths, ate loads of cakes and saw a pro-refugee protest rally/concert outside the Hungarian parliament. From Budapest we rode south-west towards the huge Lake Balaton and then south to Pecs – probably our favourite town along the whole journey. From there we crossed back into north-east Croatia and spent the last three days riding back to Zagreb. Overall, we spent about 20 days actually riding – our longest day was 82 miles but it wasn’t the toughest one. We thoroughly enjoyed seeing some new places…but now we’re really looking forward to returning to Portugal in January! Where’s the oversize baggage counter?